With the demise of home economics in the school system, many adults have no baking experience at all, relying on dreary store-bought baked goods and artificial mixes to satisfy their cravings. 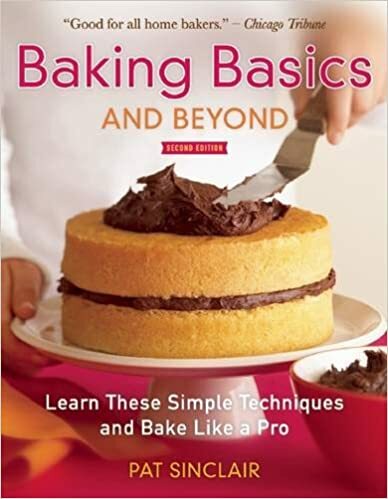 Baking Basics and Beyond allows even absolute novices to prepare a wide array of delicious, healthy breads, cakes, cookies, pies, and more. In a warm, reassuring manner, Pat Sinclair leads beginning bakers step-by-step through each recipe, thoroughly explaining each technique and direction. After learning a basic technique, additional recipes provide further practice and more elaborate results. This second edition contains more than 100 recipes, from old favorites like icebox cookies, cornbread, and brownies to updated classics, including Butterscotch Cashew Blondies, Chai Latte Custards, and Savory Wild Mushroom Bread Pudding. Throughout, explanations and precise tips, based on Sinclair's years of baking experience, make readers feel as though there is a friendly teacher in the kitchen, peering over their shoulders, and guiding them toward perfect results, every time. This new edition of this basic, down-to-earth, reader-friendly baking guide is updated with beautiful full color photos throughout.